The Power, natural gas, telephone and television lines are prepped for hookup on the exterior of the house. The gas main seen here will attach to the gas meter and then enter our home for our hot water tank, stove and heating system. 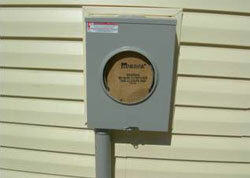 The electrical meter box is attached and conduit is run with the main line to the nearby underground electrical junction box, as this neighborhood has its utilities entirely underground. Telephone and cable will run to their respective companies for termination as well. For some, it is a mere contraption bound together by a transparent circular casing and mounted on a wall or enclosed in a box within their property, hardly worth their attention. However, a power meter is more than a mere decoration for one's residence, as it serves an important role in determining the amount of electrical consumption of a residence, an entire building, or even a single appliance. Power meters give out readings of the electrical consumption over certain periods, with the most common billing unit used being the kilowatt-hour. The installation of power meters is dependent entirely on the electric company that will be supplying electricity to the household, which means that wherever the power meter is installed it is beyond the control of the homeowner. Foremost among the considerations with regard to the placement of power meters is the accessibility of the location of the power meter, which makes the task of reading the meter easier for their workers or technicians. Some companies opt for the installation of power meters inside the homes of their customers, placed alongside the panel boards and consumer units. Most electrical companies, however, simply choose to install the power meters outside of the premises of the homeowner, although there are still considerations regarding the placement of these meters. One of these is the accessibility of the meter without, of course, entering the property of a neighbor. There is also the risk of vandalism and tampering which is imminent whenever power meters are installed in an area that is easily accessed by an outsider. Some neighbors, however, simply choose to agree mutually on sharing the location of their power meters, which they usually place beside each other. The placement of the power meter, however, does not affect the power consumption of the home or building whose electrical consumption it measures, simply because the purpose of a power meter is simply to measure electrical consumption and give out the readings of the consumption. That is not to say, however, that power meters are useless to homeowners. Power meters not only give accurate readings of electrical consumptions. They also pin-point exactly where the bulk of the electrical consumption is coming from. These devices can be utilized for homeowners to keep track of their own electrical consumption, which would allow them to be keener and more conscientious on their consumption of electricity, thus indirectly reducing their power consumption. By keeping track of one's consumption of their electricity, they will be more mindful of how they consume their electricity, leading to the conservation of energy. Parents who are determined to keep their electrical consumption at a minimum can use these power meters as a means to teach their children to keep track of their consumption of electricity. A new kind of power meter, called the smart meter, even allows the close monitoring of power consumption while also detecting problems in the quality of power that is supplied to one's residence and assists technicians in times of power outages. Now who says that power meters are merely decorations or useless contraptions that adorn the exterior of our homes? These are just some of its uses, and even though their placements may vary depending on the preference of the electrical company supplying the electricity, their purpose still remains the same and is not a factor in the reading of the power consumption that it gives out.